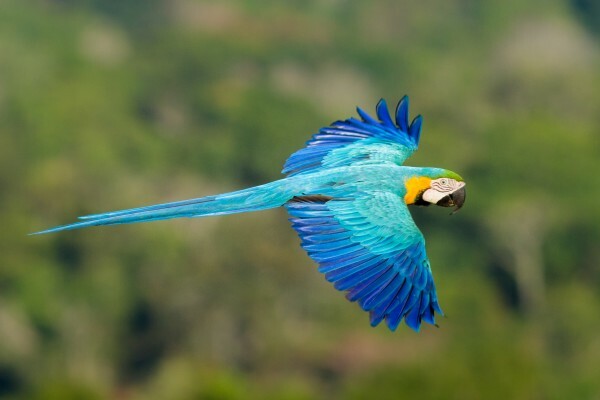 As a popular Brazilian song has it, Brazil is “blessed by God, and beautiful by nature”. If this is true – and we think it is – the main reason for this is the Amazon. 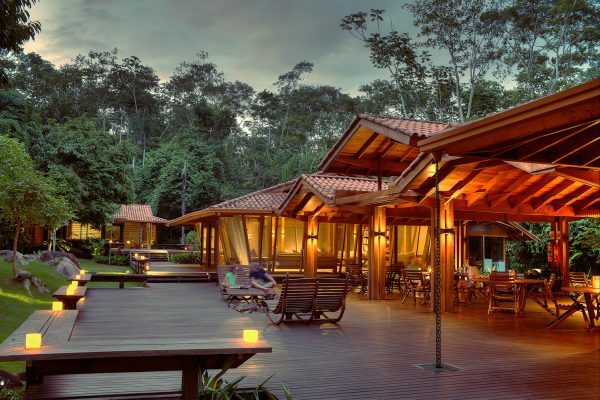 But the Amazon is a World patrimony which everyone should visit at least once, and not accept anything less than a unique experience, as Cristalino Lodge offers. 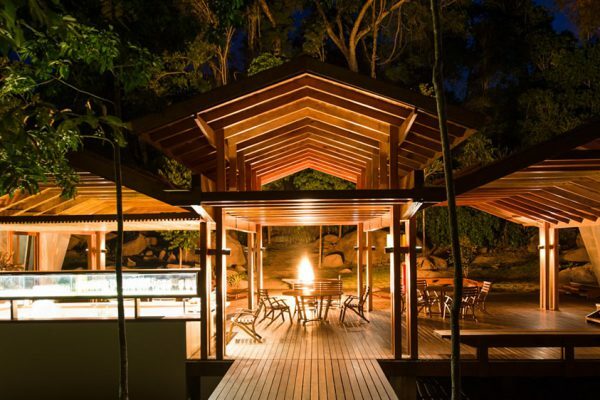 Located in the middle of a private reserve with more than 11 hectares, the hotel offers unique outdoor experiences such birdwatching, with nearly 600 species of catalogued birds, hiking, canoeing, boat outings and more. 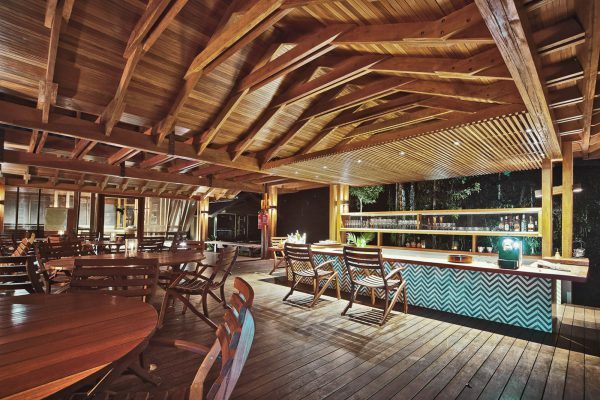 At Cristalino Lodge you will feel like a part of the Amazon. SUL Hotels Tip: The hotel has 2 observation towers, each of them with up to 50m height, for you to enjoy an unforgettable view above the treetops. The sunrise and sunsets from there are a nature spectacle, be sure to be the audience for it! There are 18 accommodation options, divided into 5 categories, all designed with natural meterials, solar energy and in total harmony with the local setting. The hotel also offers extra coziness such as digital safe boxes and towels to use after swimming in the river. It is a match between comfort and sustainability. 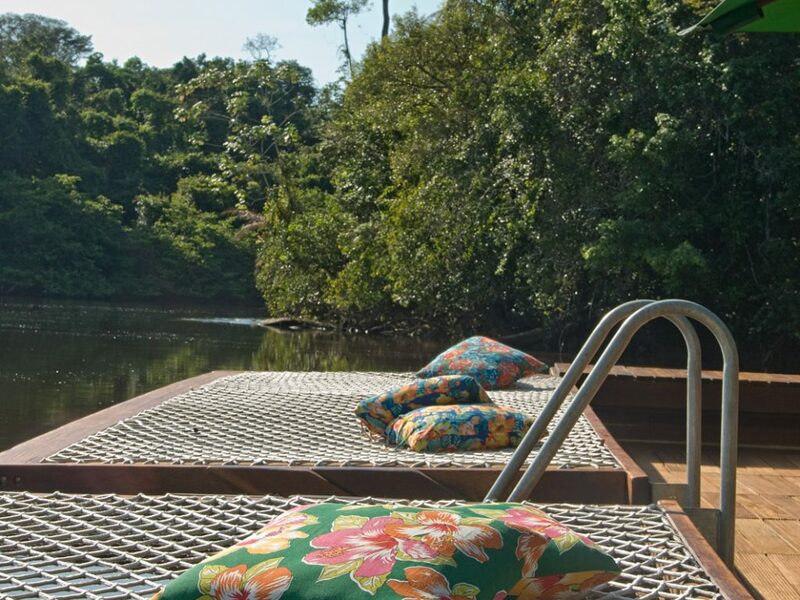 This is a unique accommodation, for those who want to enjoy the Amazon in true style. 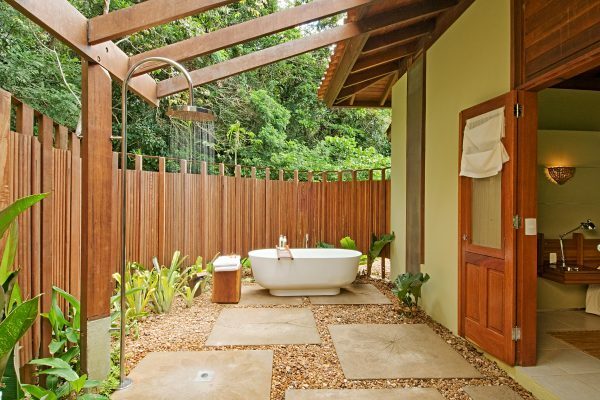 It has an additional external shower with hot water, located in a private garden. 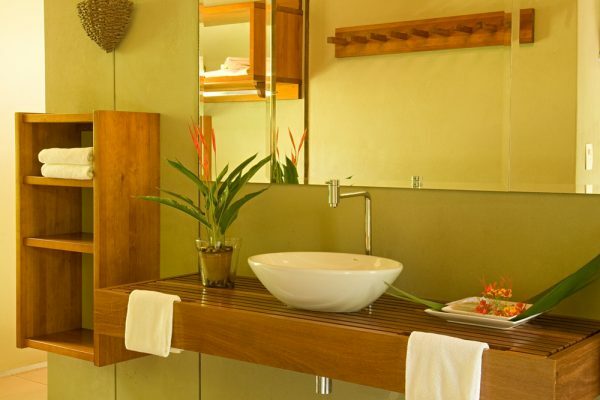 Natural Granado amenities, made with castanha-do-pará, complements the sophisticated experience of this spacious room, with 79sqm of comfort. All bungalows have two comfortable beds, an anteroom with two sofa beds, a very spacious bathroom, ceiling fan, windows with great outside view, balcony with chairs and sun loungers, and the outdoor shower in private garden. 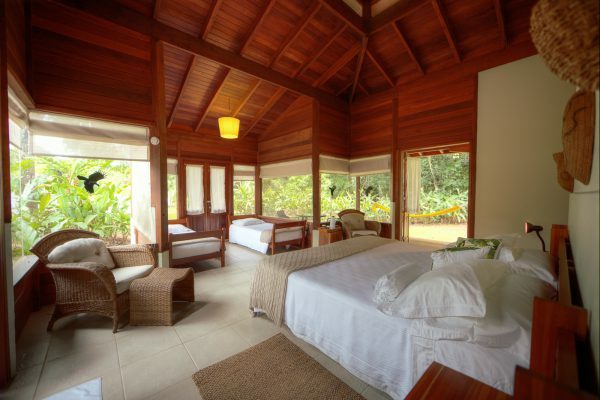 Built in a single unit, Bungalows can accommodate up to 4 people. 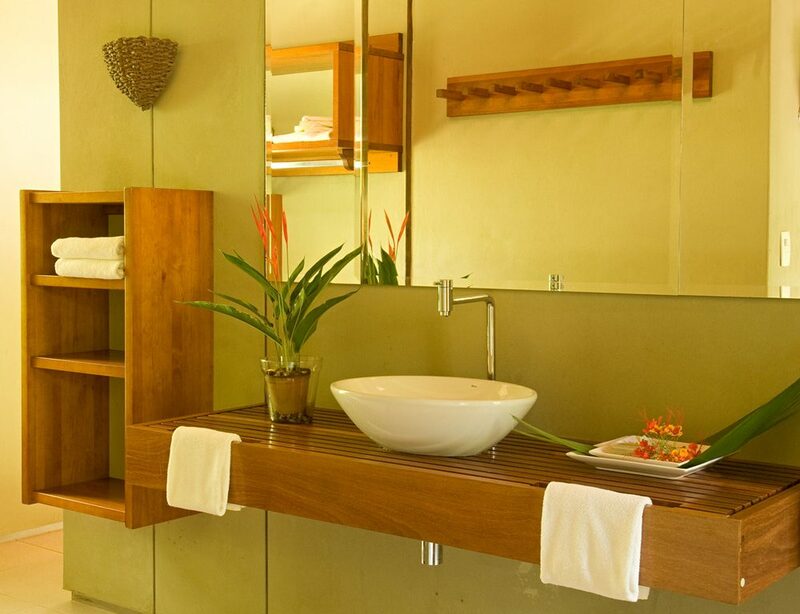 The junior bungalows have 60sqm with contemporary decor mixed with natural elements, making up a cozy atmosphere. it can place 3 comfortable single beds or a king size bed with the special touch of the Trousseau bed linen. Comfortable armchairs and a desk are available for reading, as well as large windows to contemplate the exterior. 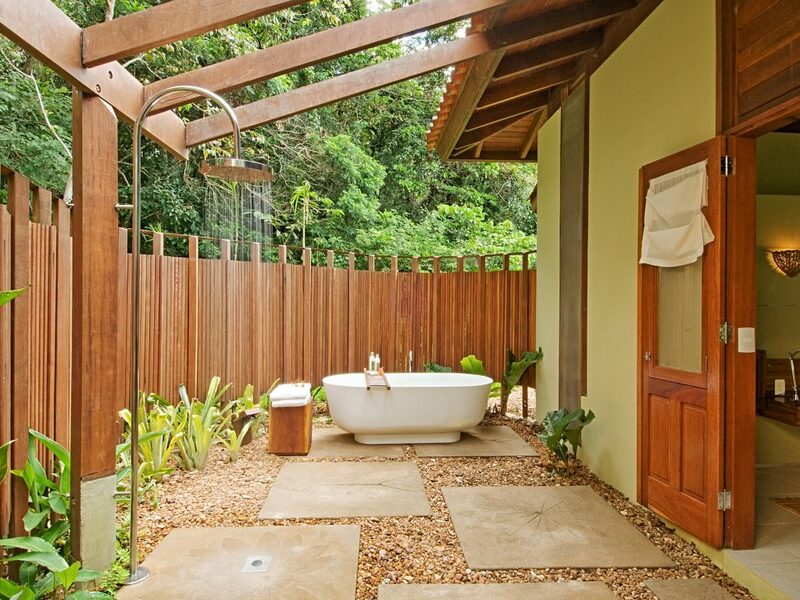 Besides the spacious bathroom, you can connect with nature in the outdoor shower with Granado amenities, and in the private garden. 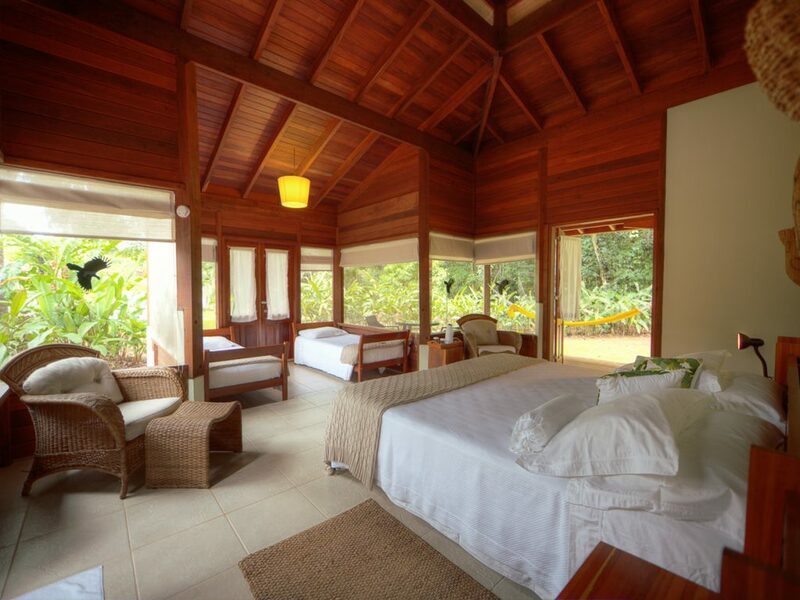 They are bedrooms with two comfortable beds, a spacious bathroom with two separate ambient, an outdoor shower in private garden, ceiling fan, large windows for a wide view of the beautiful surrounding area, table for a relaxing read, and a small balcony with a hammock. 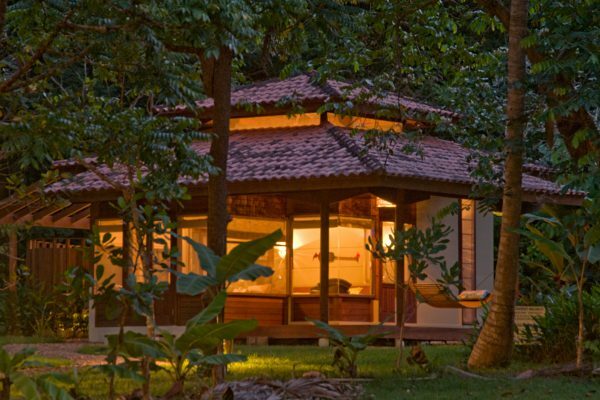 The place is all about tranquility and, even immersed in the Amazon, you will feel at home. These rooms comfortably accommodate up to two people in a 53sqm area. The Standard rooms at Cristalino have a simple regional décor featuring local culture. These 22sqm apartments offer two to three beds, ceiling fan and a private bathroom. 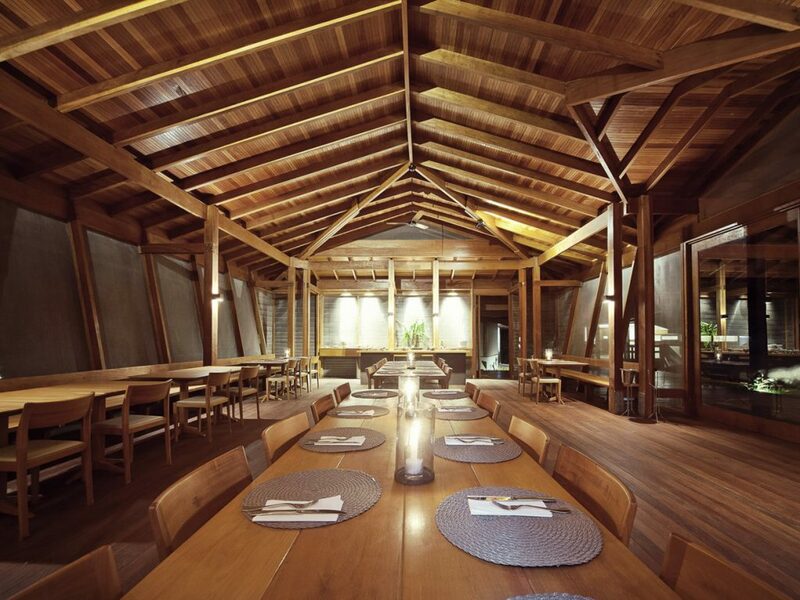 The facilities have been carefully designed with sophisticated wooden structures, ceramic floors and refined decor. Large windows were designed so guests could admire nature even from inside the rooms. 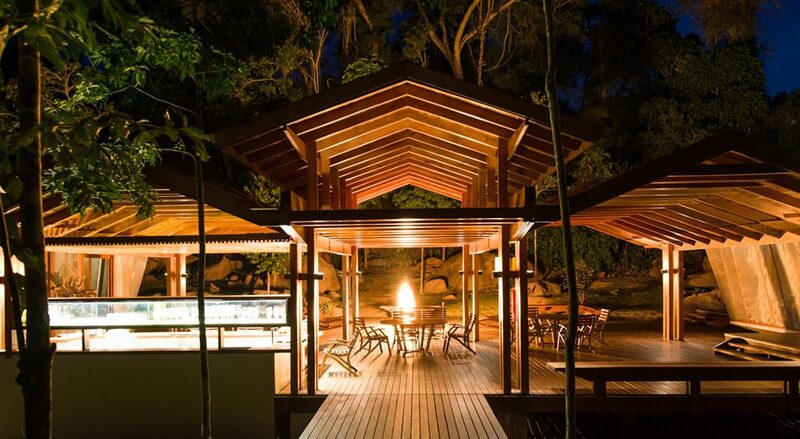 In 2011, the authenticity and natural beauty of the property placed the lodge among the 19 best hotels in Brazil, according to National Geographic Traveler. At Cristalino, you will live an incredible experience in the largest biome on the planet, fully immersing in it during the outdoor activities, accompanied by full experience guides. 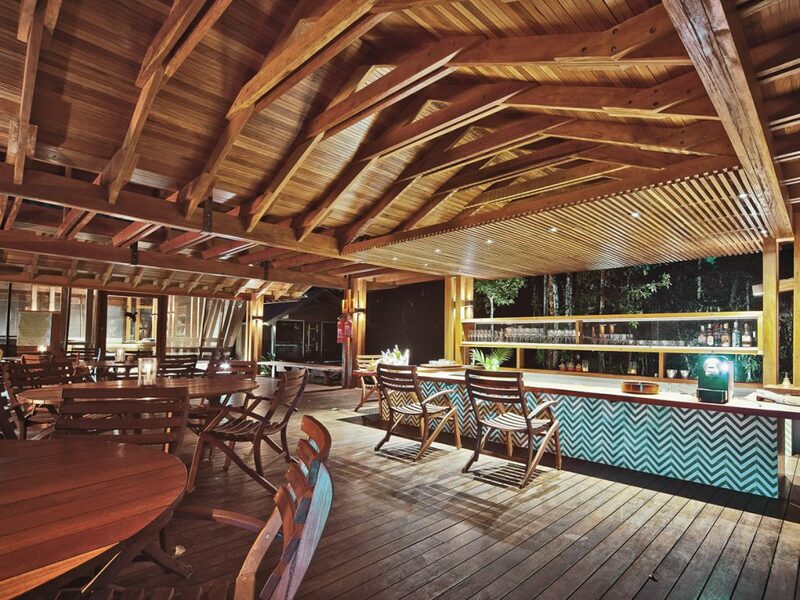 To guarantee a relaxing time at the end of the day, enjoy the fine dining at the restaurant, have a great drink at the bar and gather around the bonfire on the floating deck. All of this with nature’s unique soundtrack! 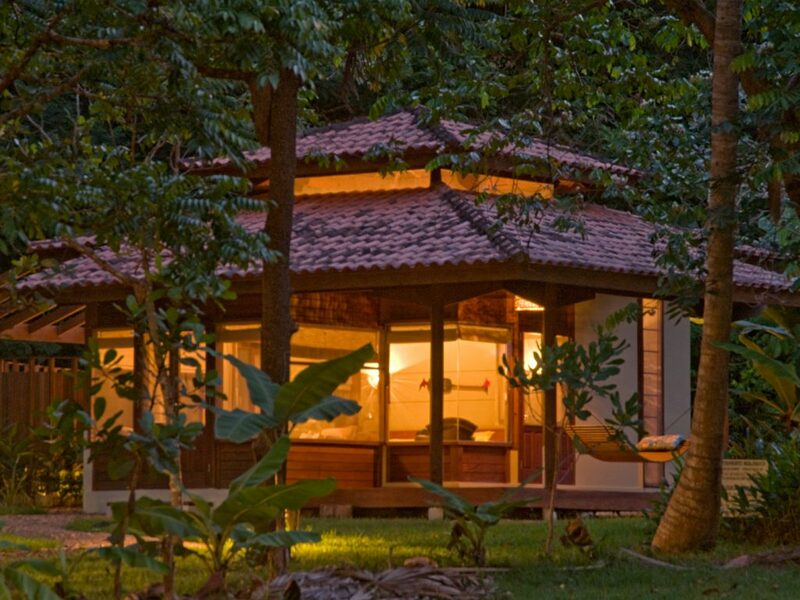 Sustainability is a strong pillar of the hotel to preserve this paradise as it is. 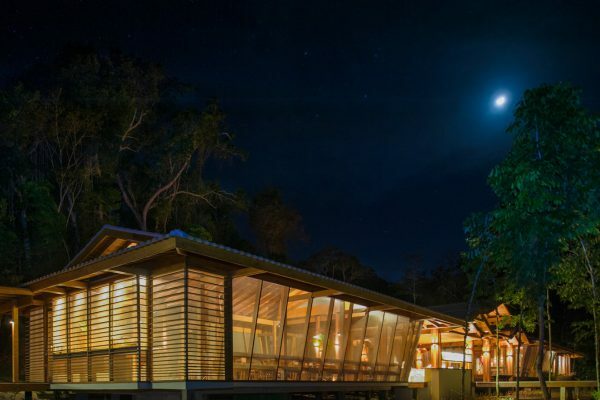 Cristalino Lodge offers minimal-impact tourism by providing solar heated water, effluent water treatment, permaculture techniques, air vents on the roof for natural ventilation, biodegradable cleaning products, recycling and more. The place also privately protects 11,399 hectares of primary forests, an area six times larger than the Fernando de Noronha Archipelago. 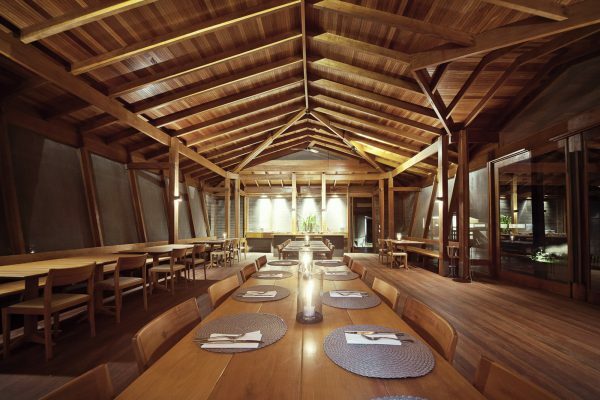 No wonder, in 2008 the lodge received one of the world’s most important sustainability awards, the World Savers Awards. 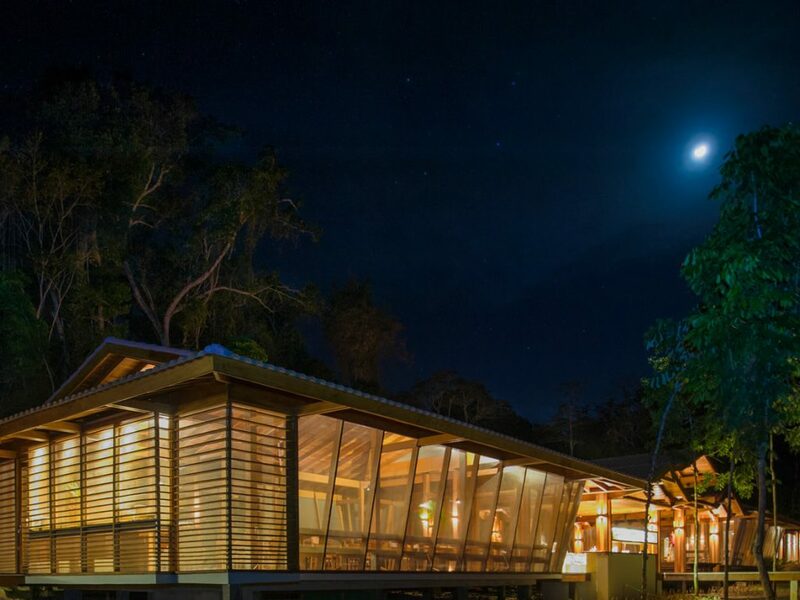 Cristalino Lodge is located in a really unique place: the southern Amazon, considered of extreme importance for biodiversity conservation. 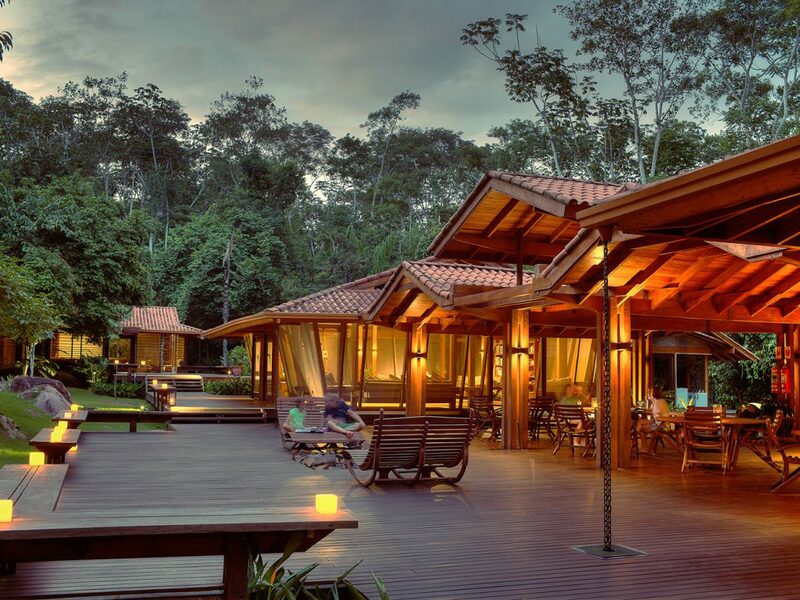 The hotel is in a private reserve with more than 11 thousand hectares, surrounded by the Cristalino Park, with more than 180 thousand hectares. The calm waters of the Cristalino River runs nearby hotel, where the name comes from. The weather is warm during the day, and cooler in the evening, year-round; from June to November nights get even cooler as it is the dry season. December to May is the green season when the forest becomes even lusher, full of flowers and fruits. Cristalino Lodge runs throughout the year and regardless of the season you choose, you will surely enjoy unforgettable moments of nature immersion. 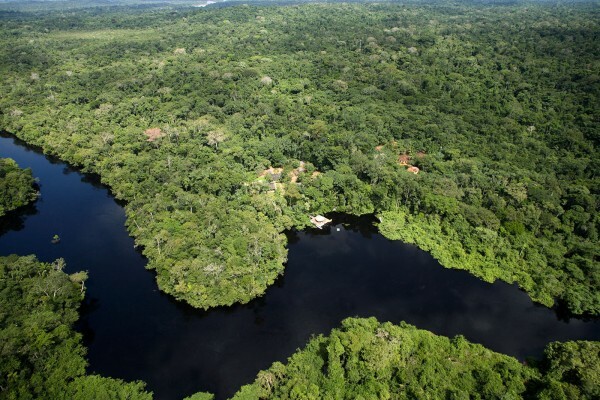 Can you imagine seeing the Amazon forest from above, as if you were flying over it? 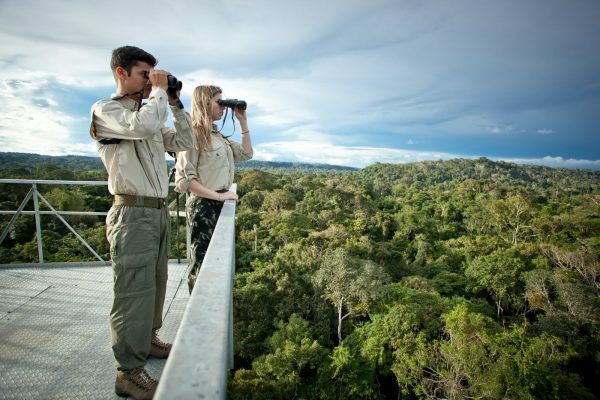 The 50m high observation towers at the lodge offer you this unique experience. 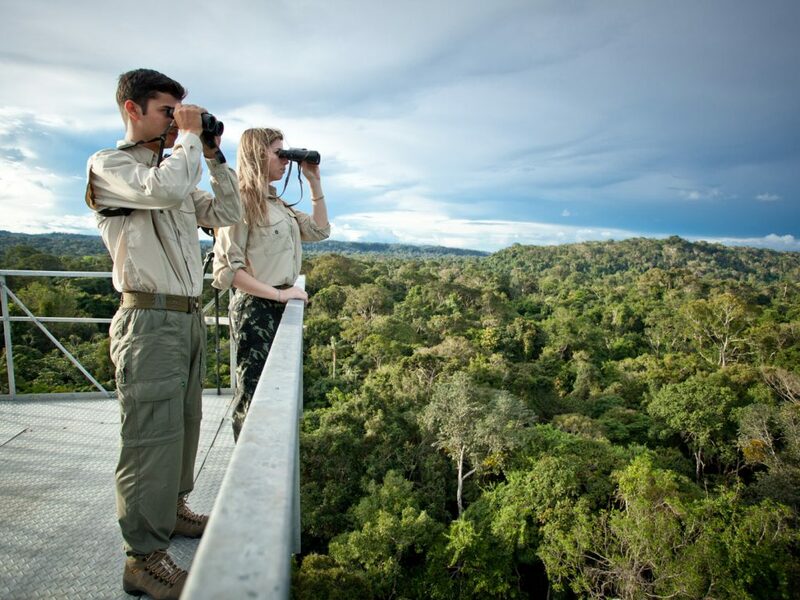 No wonder they are considered one of the best watchtowers of the Amazon! But the Amazon is not just to be seen, but to be experienced hands-on. 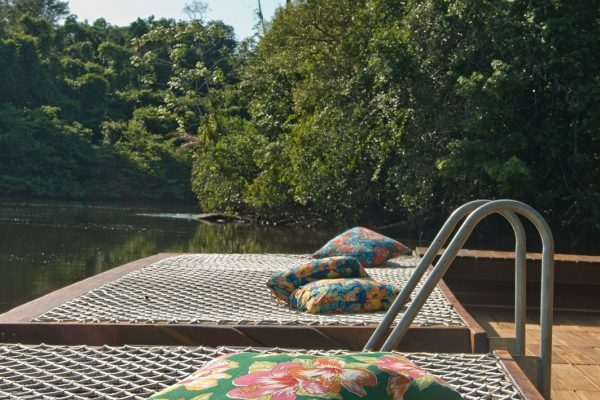 For that, the hotel offers jungle treks, canoeing, boat outings and many outdoor activities in constant contact with nature. One of the main advantages of Cristalino is that all groups are small (up to 8 people), ensuring a very genuine experience. The nearest airport is in the city of Alta Floresta, where only one airline (AZUL) operates flights to, always via Cuiabá. Upon arrival in Alta Floresta, it takes a 1hr drive and another 30min by boat to reach the hotel. The transfer to the hotel is not only included in the package, but is an attraction in itself, so make sure to have your camera ready for it!